Born in La Junta, CO. Family moved to Amarillo TX when she was 2. Graduated Nursing school in 1946 when she was 21 from Dallas Methodist. Married Bernard L Tatom in Aug 1946. They moved across hwy 80 in East Texas while Bernard worked for AT&T laying phone lines. They moved to Tulsa before Nanci was born in 1950. Dorothy never worked while the kids were in school but always kept her nursing license current. In 1970, St. Francis offered a refresher course and paid for you to attend if you committed to working for them at 2 years. At this time Nanci had finished high school and Leroy was a senior. Dorothy went to work in 1970 after completing the refresher course and worked for 21 years and always worked 11P to 7AM. Bernard died in 1973 so having this job opportunity was a true blessing. She said she loved these hours because she could take care of patients and not have to worry about the visitors. 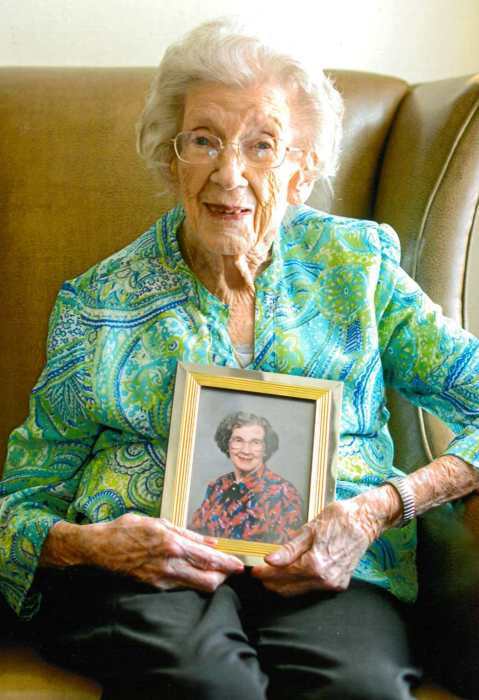 Dorothy retired in 1991 and loved to travel on bus trips with her friends. She made a trip to Hawaii, took a Fall foliage trip, trip to Branson and to Yellowstone. She traveled frequently with Nanci on bowling trips and got to see a lot of the country. She even won a car at a tournament in Alexandria LA once. Her granddaughter, Stephanie was born in 1993 and she was Dorothy’s pride and joy. After she retired, she began bowling and loved it. Bowled in a couple of leagues each week with her best friends and carried about a 140 average. She was able to bowl until she was about 87 when she fell and fractured her pelvis. After Leroy passed away in 2007, she sold her condo and Nanci and Charlie sold their house and bought a new one that could accommodate all of them. Dorothy lived there 10 years before falling and breaking a hip in July of 2017. At this point she was wheelchair bound and moved to Bellarose Retirement Center.